The water at the ice dam in northern Idaho was 600 m (2000 ft) high and upstream covered what is now the city of Missoula, Montana, to a depth of 300 m (1000 ft). Shorelines from this ice age lake are commonly seen in the valleys of western Montana. It is believed this giant lake emptied in two days, rushing 120 m (400 ft) deep over the present locations of Spokane, Washington, and Portland, Oregon. It sped at up to 100 kph (60 mph) through tight spots in eastern Washington and 80 mph through the Columbia Gorge between Washington and Oregon. It rapidly carved out the distinctive landscape known as the Channel Scablands, including the majestic canyon known as Grand Coulee. Figure 1. Shorelines of glacial Lake Missoula along the eastern hills of the Little Bitterroot Valley, 75 miles northwest of Missoula, Montana. Geologists believe that it is about time that a marked trail commemorating the flood’s path and explaining its significance needs to be set up from western Montana into northwest Oregon.2 Just like with the path of the expedition of famous US explorers Lewis and Clark, and that of pioneers who followed the Oregon Trail, scientists plan to set up signs and interpretive centers highlighting important features along the 600-mile flood path. With the proposed help of the National Park Service, these memorials will be placed mostly along major highways, which would draw large crowds. The interpretive signs likely will tell the usual story of how J Harlan Bretz first noticed the strange landforms of eastern Washington and how he postulated a flood of enormous magnitude. While pointing out the abundance of features supporting the Lake Missoula flood, the story will continue with the fact that geologists of the day did not believe Bretz, who was finally vindicated with field research. The signs are sure to mention that geologists now believe there were well over 50 floods over a period greater than 2,500 years at the peak of the last ice age, some 14,000 years ago. Figure 2. 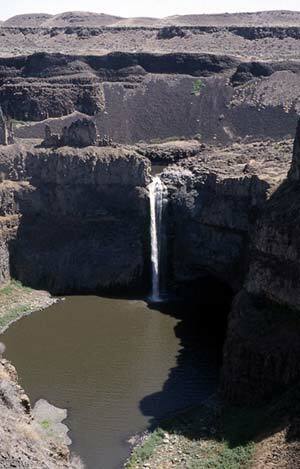 Palouse Falls within Palouse Canyon, southeast Washington. Palouse Canyon was cut through about 500 feet of basalt lava in several days when the Lake Missoula flood overtopped a ridge. I also do not expect the flood pathway stories to tell that the flood eroded, in several days, 50 cubic miles of basalt and silt that resulted in deep vertical-walled coulees with flat bottoms. Grand Coulee, up to 50 miles long and 900 feet deep, likely was excavated very quickly by receding waterfalls. Geologists would expect such canyons to have been carved in millions of years by present-day streams. It is surely doubtful the signs will reveal that the flood rhythmites, repeating layers of sand and silt over 100 feet thick, formed in side canyons in several days. Sediments like these rhythmites would normally be assumed to have been laid down in hundreds of thousand, if not millions of years. The article in the Yakima Herald-Republic 7 even had the gall to say, ‘By any account, the Old Testament flood was a leaky faucet by comparison [with the largest Lake Missoula flood].’ It is only by willful blindness to geology and Scripture that they can make a statement like this (2 Peter 3:3–6). Oard, M.J., The Missoula Flood Controversy and the Genesis Flood, Creation Research Society Monograph 13, Creation Research Society, Chino Valley, Arizona (in press), 2004. Return to text. Frazier, J.B., Massive ice age floods are largely unmarked—move afoot to mark Missoula Floods with interpretive flood pathway across four states, Yakima Herald-Republic, Yakima, Washington, p. 10A–11A, 5 October 2003. See also: Frazier, J.B., Experts seek trail to mark Ice Age floods, Associated Press, <www.boston.com/news/science/articles/2003/11/10/experts_seek_trail_to_mark_ice_age_floods>, 10 November 2003. Return to text. Shaw, J., Munro-Stasiuk, M., Sawyer, B., Beaney, C., Lesemann, JE., Musacchio, A., Rains, B. and Young, R.R., The Channeled Scabland; back to Bretz? Geology 27:605–608, 1999. Return to text. Oard, M.J., Only one Lake Missoula flood, TJ 14(2):14–17, 2000. Return to text. Oard, M.J., Evidence for only one gigantic Lake Missoula flood; in: Ivey, Jr., R.L., Proceedings of the Fifth International Conference on Creationism, Creation Science Fellowship, Pittsburgh, PA, pp. 219–231, 2003. Return to text. Oard, Ref. 5, pp. 228–229. Return to text. Frazier, Ref. 2, p. 10A. Return to text.